The Society administers a financial service aimed at providing emergency loans of up to $1,000. 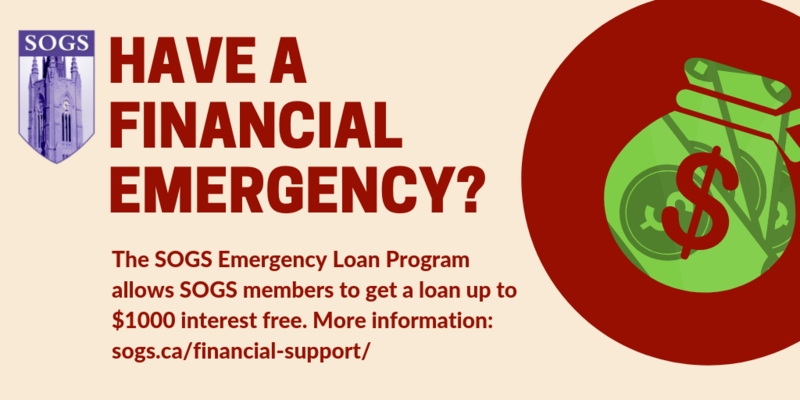 SOGS members in good standing may apply for an emergency loan. Financial emergencies are tough, and we understand that sometimes you need a little help. Emergencies are wide-ranging, so we don’t judge; we just help. In an effort to help our members, the loan is interest-free. Loans are secured through post-dated repayment cheques. How does the Emergency Loan Program work? We loan you anywhere from $100 to $1000. You repay us within 3o days or three months, depending on how much money you are loaned. For example, if you take a loan for $100-$900, you must repay it within 30 days. If you take a loan for $1000, you can repay SOGS over three months, typically in equal payments. Please be advised that you must show income on the application form as this is a loan program and not a subsidy/bursary. How do you obtain the loan? Take it to your home department and have your Graduate Administrative Assistant/Graduate Program Co-ordinator or Department Chair sign off on the form. Bring the completed form to the SOGS office (Middlesex College, room 8). Once approved, SOGS can complete the loan within 3 business days. Obtain 1 or 3 cheques, depending on how much money you are requesting (see above). (Note: If you don’t have cheques, ask your bank and they can often give you some blank ones OR ask a friend/family member to lend you some). These cheques function as your proof of intent to repay the loan/loan repayment. SOGS will not release the loan without post-dated cheques written out to “The Society of Graduate Students”. Once you receive email notification that your emergency loan cheque is ready for pick-up, come to the SOGS office with post-dated cheques in hand. SOGS will cash your cheque(s) on or shortly after the date(s) listed on the cheque(s). If you cannot make one (or more of) your repayment date(s), please contact the SOGS Accounting Manager in advance of the date(s) written on your cheque(s). Email Raquel: sogs.accounting@uwo.ca. Please be advised that NSF charges apply to bounced cheques. Students with more complicated financial needs should seek appropriate support from outside the Society, such as through their department or the School of Graduate and Postdoctoral Studies.